To help our children develop scientific minds, we first focus on their powers of observation. Babies observe their surroundings from birth. However, the ability to observe well must be cultivated throughout childhood. Being able to still oneself, to notice the sounds, smells, sights and details surrounding you is key to becoming a good scientist. Children need self-discipline and self-restraint, as well as the patience for deep thought, wondering and observing. Young children need to watch the natural world in order to understand the basic laws of science and how things work. They need the time to quietly watch and understand the real world, to create small experiments, to wonder, to ask questions. In the first three years of life, our children absorb a large collection of sensations and experiences that form their psyche, or who they become. They gather impressions of heat, darkness, rough surfaces, smooth surfaces, tastes, smells, breezes, largeness and smallness, and so on. This unconscious absorbing process happens through their interactions with the world, and the more young children directly relate with the real world and acquire as many impressions as possible, the more full their “library” of resources for understanding the real sciences of physics, chemistry, botany, etc. From ages three to six, children take the chaos of all these impressions and begin to organize it in their minds. 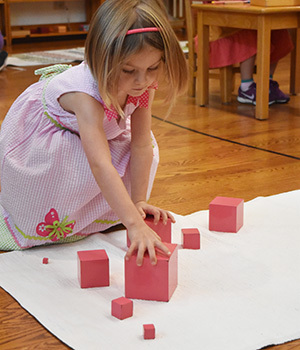 Through the Sensorial Materials in the Montessori Primary classroom, children begin to recognize differences of three-dimensional sizes with the Pink Tower, of width with the Brown Stair, and of length with the Red Rods. This begins a foundation for scientific discernment and investigation. Young children naturally explore and are drawn to compartmentalizing and distinguishing very subtle and minute differences. This is the purpose of working with the cavities and the cylinders of Montessori’s Cylinder Blocks, for instance. By working with the specially-designed Sensorial Materials, Montessori children investigate and begin to make sense of the world. Next, the Montessori teacher gives the language to name these differentiations, and children begin to own the information in a more conscious manner around ages four, five and six. The Pink Tower cubes are small, smaller, smallest; the Red Rods are long, longer, longest and short, shorter, shortest. The children can differentiate that “this rod is longer than that one but shorter than this other one.” By the time children reach age six, the Montessori environment has helped them to explore and catalog much about the world for themselves, and our children now have the knowledge to express what they see and experience. The world lights up for them because of their new knowledge. Montessori children acquire a strong foundation of science, while simultaneously developing control of their hands and body movements and the ability to focus their attention on learning—all before reaching the first grade! To meet this reasoning mind that wants to explore the intellectual world more than the physical world, our plan of education changes to match the new characteristics and needs of the six- to twelve-year-old. Instead of giving children experiences for distinguishing and discerning information that we can see, touch, smell, hear and taste, we now tell the children stories that ignite their imaginations and plant seeds of interest in a wide variety of topics, all interrelated—as they shall find—which they are then inspired from within to pursue and learn about. The Montessori Elementary teachers tell a story first about the creation of the universe, and the children burst with curiosity. They ask: “Why? How? When? How is this possible!? Is that what really happened?” Their own exploration of facts and scientific information begins as a fiery quest to educate themselves—a quest that goes on and on, as new information begets new questions and vice versa. The first story is called God with No Hands to accentuate the mystery of how this first explosion that created our universe—as far as humans have been able to relate—happened without hands causing it or carving its parts. The children then look to atoms, protons and neutrons. They learn how molecules behave when heated and when cooled. They learn about how some molecules attract one another and others repel, and about all the drama of science in early space. This first story gives a foundation, a source, on which the children can focus their wandering, wondering minds as they begin to uncover for themselves the history of the universe and everything in it. From there, the children build an inner scaffolding, placing each new bit of information they discover into the structures they themselves design in their minds, each one making sense to that particular child with his or her own way of thinking. In this way, Montessori children create their own science educations, with help from the teacher who offers presentations that give clues and bits of information that each child can take and arrange neatly into his or her own mind as they go along. In the presentation of that first story, the teacher sets up and conducts several experiments which make lasting impressions that inform the children on basic scientific facts. All matter settled into one of three states, for instance: solids, liquids, and gases. The children see the ice cube, the water in a glass, and the empty glass of air and understand that everything is in one of these states. Later they may discover that there’s more to this, but this is the start of understanding all matter in the universe and how it is categorized. Their inquisitive minds surge forward on a never-ending journey of discovery, one that is happening all the time, whether they are in school or elsewhere. This is how the scientific way of thinking is cultivated in the early years and sets our children up for deeper study in the Upper Elementary and Secondary years and throughout their lives. The positive nature of the Montessori approach, with its emphasis on process and discovery, is central to why it works so well for children in their development. When Dr. Montessori lectured in London in 1946, she pointed out that conventional education focuses on mistakes. Think of your own experiences and how your schooling was structured; you will probably remember that there was constant attention given to your errors. Avoiding errors was the thrust of the system. Even with a few enlightened, kind teachers here and there who emphasized process and exploring bravely, the main message for how you were to learn things was by having your mistakes pointed out to you daily in the form of testing, performing in front of classmates, and reaching for the one “correct” answer to each question. This emphasis, by design, encourages children to lose confidence in their originality. And, yet, we know that developing unique perspectives is invaluable. Thus, the very thing that makes society prosper is being discouraged on a daily basis in our conventional school model. Y ou may be wondering how there could be another way to teach, when there are certain areas in life where there really is just one correct answer. Mathematics and science are not a matter of opinion, for instance. There are facts that children must learn in order to succeed in some areas. Which is more important: the process, which leaves room for originality, or the answer, which must be consistent with the truth? The answer is both, and Montessori’s approach allows for this interesting dynamic to play out in the classroom, as it does in real science laboratories and in sophisticated math discussions. Dr. Montessori discovered that there is an alternative way that children learn about exact answers. Montessori’s view was that there is exactness in mathematics and science, which gives our universe balance and beautiful symmetry. Realizing this is truly awe-inspiring for children! But instead of having this phenomenon of exactitude dominate the whole educational approach by trying to stuff answers into children’s minds, Montessori sought to awaken their wonder for exploration and to help children discover pathways of thinking that lead to correct answers. A prime example of this is the way elementary-aged children explore math through the specially-designed materials that require several steps and attention to detail. The children ultimately arrive at the correct answer and are often quite satisfied with themselves after much effort; all the while, they are developing cognitive processes and character traits that contribute to future learning and problem-solving. Through the materials and how they are presented by the trained teacher, Montessori children in an Elementary classroom search for the paths to find the true answers; when they get there, the results they come up with are their own discovery, just as if they were the first mathematicians to discover them. The result of this repeated experience makes children view mathematics as the wonderful puzzle that it is. The idea of being embarrassed at arriving at an incorrect answer is foreign to these children, for whom the taste of finding the right answer is so sweet that they want to explore other avenues and learn more. Mistakes are integral steps in every journey, and this reality becomes familiar and acceptable through repeated experience. The Montessori materials guide children to find the ways that work, making the adult corrector obsolete in many cases. For instance, when two children do long division problems together with a material called Racks and Tubes, there are many places they might err. They could start off incorrectly by placing the tens board to the right of the units and work through the whole problem incorrectly, only to find at the end that their answer is incorrect (either by bringing it to an older friend who can do the problem longhand on paper, to the teacher who can check it, by using another math material to do the inverse problem and see if it matches, or by checking it themselves against a calculator). They go back to their work—puzzled—and like two detectives, they re-examine how they set up the problem (which is often when they will identify this first mistake), or they employ a friend to see if they can identify where they may have lost the path. In my experience as a Montessori elementary teacher, this is when the fun really begins if the adult supports an attitude of curiosity about finding the error. Children will repeat a problem over and over, sometimes eliminating just one of several mistakes at a time in the same math equation or process. The important thing is for the teacher and community to support the quest to get to the end, so that the children do not fall into a habit of giving up too easily or repeat making the same mistake so many times that it gets ingrained! By keeping tabs on their progress, the teacher can see when to step in and point children in the right direction, perhaps making an observation and/or asking a question: “Oh! Wait, I see­—look where your units board is. Do you remember where it belongs?” This is usually all that is needed to get an “Ah-ha!” and a delighted, re-energized effort to try the whole thing again. Children are remarkably resilient, especially when working with a friend and being allowed to own the whole process of the math equation. When they finally, leaning over the calculator with suspense, find that they have achieved the correct answer by their own efforts, it is an excited triumph that feeds the urge to tackle more and more problems. Very rarely have I seen children want to get to the answer easily so they can quit. There are some who will be tempted to use a calculator to find the answer and just write it in, sometimes several times, to create the illusion that they have accomplished a lot of “work.” You may be surprised to hear that in a Montessori environment, that is actually the exception and not the norm. Teachers usually catch that pretty quickly, but even if they didn’t, and even if other children did not point to it and demand that the child work honestly and just as hard as they do, the child who does this often abandons the practice after watching others glean the internal rewards of sustained efforts and true glory of finally getting that answer. As children experience this quest again and again, they hone their skills each time. Eventually, the exercise becomes too easy for them, and they are ready to advance to another math process that brings them to their next level of challenge. To describe all the ways children might err in the process of long division with Racks and Tubes would take too long here, but I’ll give you a sense: One child may write the problem down differently than their companion and, therefore, lay out some incorrect amounts when distributing the beads to be used—a mere flipping of two numbers, perhaps. This carelessness will eventually be discovered, and both children will realize the importance of double-checking with each other before they begin. They also might place the working number of beads in the wrong category or confuse the order of the categories (units, tens, hundreds, etc.). Again, these are mistakes that reflect the need to double-check their layout before they begin the process. Another place they may err is in physically dropping a bead or beads, losing them as they spring across the floor and losing count of how many were in the bowl to be distributed. This reminds them to slow down, be careful, and focus on their physical movements. They could also lose count or forget a step if they are interrupted by conversation or stop what they are doing to attend to something else in the middle of their process. This would illustrate the importance of sustaining their focus on the task at hand until finished. Finally, they might write the numbers down in the wrong order at the end, showing again a need for more careful, focused attention and awareness. Sometimes, two children actually have two different answers written down, and they’ll be perplexed about which one is correct, garnering more discussion and a backtracking of their steps. Watching all this is incredible; the amount of teamwork, social interaction, struggle, humor, fun, and agony that can accompany such a process as doing a long division problem is positively brilliant in the sense of integrating all aspects of a child’s development as a person and a mathematician. For a Montessori teacher, bearing witness to such self-discoveries is joyful. It is a special experience to spend one’s days in an Elementary Montessori classroom with children working with the Racks and Tubes! It can take more than an hour for children to complete a challenging problem if you account for the self-correcting they may need to do, but the learning that occurs is immeasurable. And the more children work with such processes, the faster they achieve success each time, fueling their desire to tackle more challenges all over the classroom. This is just one example of how Montessori fuels the development of children’s resilience and perseverance in a very direct and effective way. And because a Montessori classroom is a vibrant community where everyone is working simultaneously on different things and seeing what others are doing, the practice of pushing oneself until achieving success is contagious. Children will stop and help each other, discuss and share a conundrum, and sometimes get intrigued with each other’s experiences of learning. The learning is therefore—in economic terms—a positive externality, meaning that the network of students spreads newfound information via witnessing and sharing experiences; this happens naturally in a Montessori elementary classroom because of children’s gregarious social behavior at these ages. This is another example of where Dr. Montessori designed an approach that employs—rather than fights against—the developmental characteristics of children in this stage of life between ages six and twelve, specifically, their tendency to be very social and to always want to find out what their peers are doing. In the above example, students may use the mantras they learned in their Primary years (ages five and six), such as “The units always go on the RIGHT” and “We always begin with the UNITS” (“except in division, when we begin with the highest category present”). Students love these little cues, and when the Primary teacher says them each time she is with children in a math presentation, the children often chant along. There are just a few such mantras that carry over from Primary to Elementary, so children tend to remember these. We have found that children benefit from having such important points of interest brought to their attention regularly, so that they can commit them to memory. When working on math and science, the children in a Montessori classroom don’t just value the exactness of a true answer; they love that there are answers to find, and they see each exact answer as a part that connects to a greater whole, creating a universal balance in which each component matters. With the Montessori approach—where the processes of discovery appeal to our children’s developmental characteristics at each age—finding correct answers is fun, sometimes eventful, and always intrinsically rewarding. Click here for a PDF of this post. In this article we examine the Four Planes of Development observed by Dr. Maria Montessori, describing some of the hallmarks of each plane and how Montessori education is designed to meet the needs of children in each plane. For a more general overview of how Montessori education is informed by children’s developmental needs, see our previous post, An Education that Matches Children’s Development. As an educational approach, Montessori is unique in taking child development into account at every level: physical, psychological, intellectual, and social. This approach is a product of Dr. Montessori’s keen observations of children from a range of social classes, in many countries, on three continents, over more than 40 years. Montessori educators today continue to make observations that are consistent with her findings a century ago. Dr. Montessori found that all children exhibit characteristics and needs for healthy development in four distinct stages, or planes of development. Understanding and recognizing these planes of development provides parents and educators with a guide to how we can best help our children. One way you can understand, identify, and remember these four phases is by thinking of the questions children seem to be asking us with their behaviors and developmental needs: “What is That?” between ages zero and six, as children explore the environment around them; “Why is It?” between ages 6 and 12, when children explore the abstract world intellectually; “Who Am I?” between ages 12 and 18, when children develop their unique adult identities; “What Will I Do?” between ages 18 and 24, when our children turn their attention to making unique contributions to their world. Infants and young children are in a “discovery mode.” They are driven, as if by an internal force, to interact with the environment and absorb all the information about the world that they can get. Think about it: Infants want to explore with their mouths and hands; they are constantly in motion, making sounds and listening, looking everywhere. They want to touch everything they can, to taste, to move. Infants and young children acquire information about the world primarily through their heightened senses of touch, smell, sound, sight, and taste. It is naturally a self-centered time because little children have an immense task to focus on: building the foundation for a life, a body, and a personality. 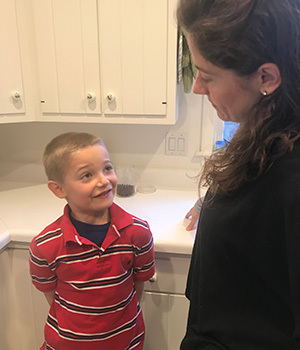 From her observations, Dr. Montessori deduced that young children have absorbent minds that can soak up incredible amounts of information, seemingly effortlessly by comparison to older children and adults. Young children acquire language, the ability to walk, dress themselves, etc., and as a result, function as humans on a basic level, all in the first few years of life. Children under age six can do this because of the outstanding capacity of their young brains to make millions of neuronal pathways. At no other stage of life do we develop so rapidly and in such major ways. Young children ask what everything is, in a constant quest for words. They seem to want to possess their environment for themselves, and so ask for the names of­—and essences of—everything around them. If we keep the young child’s quest in mind, we see that infants and young children need us to support them by providing environments that are rich in reality, culture, communication, nature, and the best of human interactions. 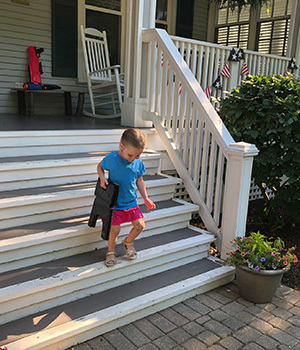 We can help young children by removing obstacles so that they can be in direct relationship with the surroundings they so eagerly want to explore. Adults must be models of behavior for children in this absorbent phase. We want to give young children the chances to move their bodies and thus learn to control their movements, to do things to care for themselves and for their environments. Through such interactive experiences, young children develop self-esteem, become more and more independent, and form a sense of belonging to their community as contributors, through their physical actions. Dr. Montessori designed the learning environment at school with appealing activities in our Young Children’s Community and Primary classrooms. These involve practical life activities that are purposeful and real and sensorial materials that help children refine their senses and learn the names for comparisons such as heavy, light, thick, thin, and the degrees of such qualities, such as heavier, lightest, thicker, thinnest, and so on. While making sense of the impressions they are collecting, young children crave physical and sequential order; in our classrooms, there is a place for each item, and we present things in a simple, attractive order. We offer many opportunities to develop motor control and the ability to concentrate, so our young children can become the masters of themselves in our classrooms. Through all of these carefully designed activities, our youngest children build themselves, naturally and joyfully. Around age six or so, we see some striking changes occur: children’s hair becomes darker, their limbs become more elongated, their knuckles stand out where dimples may have been before, their adult teeth begin to replace their “baby” ones, the proportion of their heads and bodies changes, and they do not get sick as often. Cognitively, six-to-twelve-year-olds can imagine things that they cannot see (fantasy books like Harry Potter appeal), and they can reason (they want to find out why the earth goes around the sun, not just that it does). They seem to want, more than anything, to be in groups of peers. They are practically obsessed with rules and social behaviors, they want to understand right from wrong, and they want to see justice done—so they tattle on each other to see what the adults will do. They make up clubs, they exclude some children and include others, and they worship their personal heroes like sports figures, historical figures, or fictional action figures. This stage of life is when important aspects of social organization are established in children’s development. It is also a time of rigorous mental work: children in the second plane of development are fascinated by information and have multiple interests. They seem to want to be everywhere at once, sometimes leaving a mess in their wake! The attention to detail that attracted them in their prior years now morphs into a desire for efficiency and more abstract thinking. They delight in making inferences and connections between bits of information. This is an important time of consciously creating their own organized structures of knowledge. 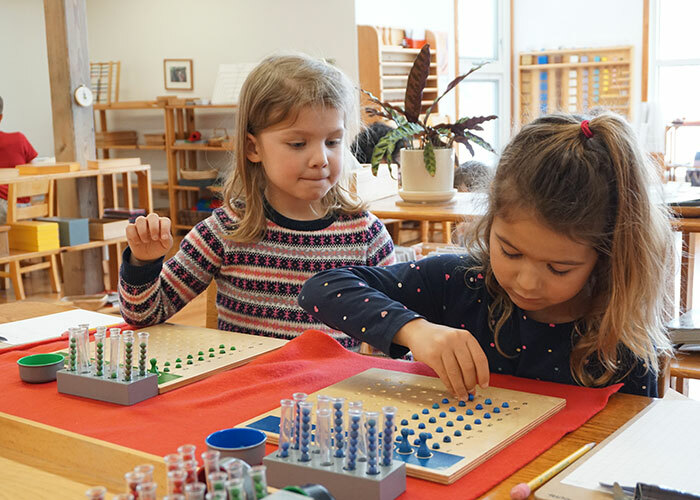 Montessori designed a learning environment that would appeal to the children’s need for rich intellectual stimulation, collaborative work, and opportunities to develop their relationships, their abilities to empathize, and their personal moral frameworks. The environment encourages the children to ask “Why?” and to seek out the answers to their innumerable questions by exploring the world of information. 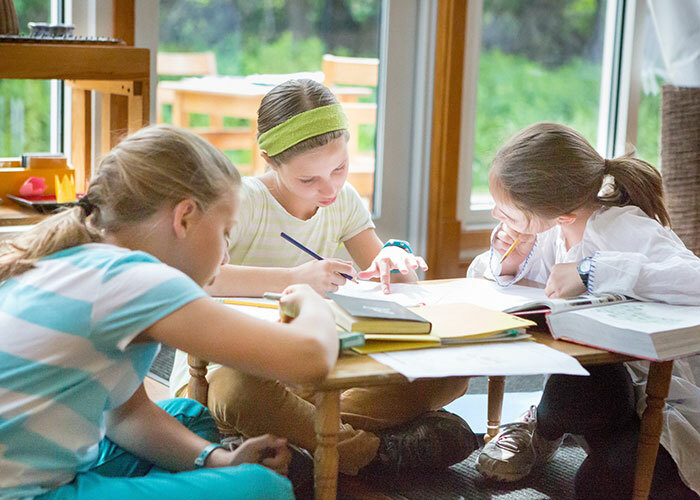 The Montessori classroom for children ages six to twelve encourages—and in many cases, necessitates—that children work together collaboratively in pairs or small groups, so that they can experience and practice how to do so effectively. This is a critical aspect of this stage of development. 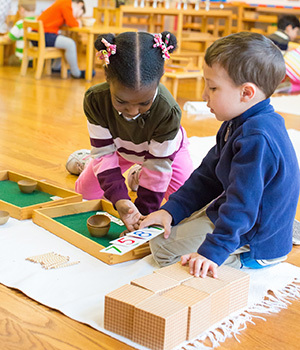 Instead of fighting against the urge to be together, Montessori capitalizes on this sensitivity by giving productive work as the central focus for learning social interaction on a deeper level. These experiences are necessary because they give elementary-aged children opportunities to think about and navigate the abstract world of interrelationships and human nature. Intellectually, we present aspects of the abstract world to Montessori students as a web of connections and historical structures that enable them to create their own unique organizational logic. Through stories of the beginnings of our universe, life on earth, human history, man’s creation of written language, and man’s discovery of the mathematical world, children’s imaginations are stirred and their awe is awakened, inspiring them to explore and acquire as much knowledge as they possibly can. To watch the children’s enthusiasm and drive as they experience this quest is amazing! Dr. Montessori observed dramatic physical and psychological changes occurring at approximately age twelve and recognized the need for specific support in this stage. Dr. Montessori called adolescents “social newborns” who undergo a kind of “rebirth” as their now confident, capable, fully-grown childhood selves morph into newly developing adult bodies and minds. Adolescents do not want to be treated as children anymore; they are eager to embark on their journey into the adult world. They are highly sensitive and easily hurt, as if nature gives them heightened awareness to ensure that they not miss any of the subtleties in the “traffic signals” of social interactions that they will need to understand as adults. This intense insecurity is why young adults need to have authentic, confidence-building experiences where they face concrete challenges and learn to overcome them in supportive environments through their own effort. Doing so repeatedly helps adolescents build their personal repertoires of strengths for adult life. This is a fragile time physically, when children get sick more easily again, and feel alternately and abruptly energized and then tired, because they are growing rapidly and changing into adult bodies. They need support to experience risks and gain confidence, but also to develop the empathy they are alerted to at these ages. They need close friends and a supportive, team-like community while they are defining themselves. This is the beginning of the child’s next task of building their newly-adult selves. It is a time of self-reflection, of asking “Who am I?” with a sense of overwhelming anticipation. Dr. Montessori saw this as a quest for what she called valorization: to be recognized and appreciated by the adult group they want to enter, through their own actions and visible contributions that are real and valued. When the children reach adolescence, they need a new, different environment to match their new, evolving needs and characteristics. The educational environment must give adolescents opportunities to prove their worth to themselves and to interact with adults who can be mentors. This can happen through physical work, such as working land on a farm, growing and harvesting food, cooking meals, building fences and necessary structures, or serving others through volunteer work. Adolescents are very interested in economics and how adults survive and live and, thus, crave experiences of raising and using money to care for their group. Having a “micro-economy”—where they produce goods and sell them—can serve this need in adolescent Montessori programs. The collective work they do helps them to understand how human society functions and orients them for their quest to identify themselves as individuals within it. 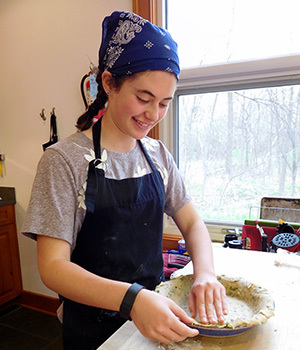 When a farm-like setting is not available, we find other ways to connect our adolescents to nature and provide them with opportunities to prove their worth, learn to work together for their survival, and connect with the adult world as contributing members. At Forest Bluff, our adolescents do this by selling crafts they have made, interacting with adults in the village at the post office and bank as they make transactions for their classroom and school, caring for the prairie and land around the school buildings each week, and planning the safety, transportation, food, equipment, finances, and service work of the three camping trips they go on each year in remote natural settings. Their trips involve working together to solve problems, survive as a group, and serve the adult world through physical work, leaving behind a real contribution with structures they build for other organizations. On the intellectual side, the third plane of development is a time of deep reflection. Adolescents are drawn to reading and discussing literature, examining scientific ideas and the mathematical contributions of others, and expressing themselves through writing, athletics, music and other art forms. Collectively, these and the above experiences serve the question “Who am I?” with the valorization and confidence our adolescents need to develop as they enter early adulthood. At approximately age eighteen, if the needs of each prior phase were met, we see young adults who are confident and ready to start making their unique contributions to adult society. This is when our children branch out into communities with more knowledge and experience, as young adults themselves. This is the time for deeper, more specialized study, for helping others with unique contributions, and for instigating change in their communities. This is when you see young adults forming their political views and starting their careers in the workplace. They often want to travel to other countries and explore the world with their own two feet. It is also a time of steadier physical growth and strength. Roughly around age 24, a child’s massive job of building his or her adult self is basically completed. Modern fMRIs confirm that the first three years of life have great importance with massive brain development, and around the ages of 6, 12, 18, and 24, spurts of rapid brain change occur. In one’s mid-twenties, the brain matures, and although it continues to make and prune neuronal connections throughout its lifetime, this activity consolidates around age 25, correlating with the idea that childhood ends and adulthood begins around that time. A child’s successful development in each plane—or stage—of life depends on the attention given to the needs and characteristics of the previous one. There is no such thing as rushing through one stage to get to the next, or skipping steps. Certainly, we continue to work on developing characteristics throughout our lives; we never stop growing and improving our abilities. By understanding and recognizing when nature has given us the sensitivities to acquire certain attributes, and designing learning environments that meet children’s developmental needs, we give children tremendous advantage. This is how Montessori capitalizes on human development. The discovery of the Four Planes of Development and how education can match them is certainly one of Dr. Montessori’s greatest gifts to parents, educators, and our children. Our ultimate goal is to support children to develop themselves fully in all aspects, so they will be happy, successful, and contribute to society in meaningful ways! The Montessori approach of education is different from any other from the outset: Dr. Montessori recognized the importance of seeing each child’s life as the whole and continuum that it is; she then formed an educational model that matches children's development, aligned it with the particular needs and characteristics of each stage of growth, and provided the flexibility to meet individual needs along the way. The school model we are used to seeing is a one-size-fits-all, linear model that increases in complexity and demands sequentially each year. Its design does not take into account children’s observable characteristics, developmental needs, or natural stages of growth. For example, think of a conventional preschool: The children are asked to sit in a circle, join a group activity, and move mostly as a unit through communal activities. And yet, young children are developing their individuality; they want fiercely to learn to do things for themselves (“Me! Mine!”), and need to do so, in order to gain basic life skills and the prerequisite abilities of organized thought and self-control for later learning. In conventional preschools, young children are also typically encouraged to spend some time in fantasy-based play. And yet, this is the stage in life when they need to gain an understanding of reality in order to succeed; they need real, visible, purposeful activities that they can engage in as individuals, to practice physical motions and fine tune their control, and to gain basic, unconscious knowledge of concepts such as weight, gravity, force, cause and effect, and so much else about the world around them, through their own hands-on explorations. Between the ages of six and twelve, children also have a strong propensity and ability to imagine what they cannot see in front of them; their imaginations can aid them in learning about abstract concepts and realities, and they can draw out the meanings from fantastical stories such as myths, fables, and stories of good and evil. Looking at such patterns in child development, Montessori and her colleagues designed environments to meet children’s needs by taking the characteristics of each stage that naturally facilitate learning into account. Montessori education begins with newborns—and the continuum which follows leads all the way to adulthood —meaning that Dr. Montessori saw this as the goal of childhood: to build a human being capable of participating in, and contributing to, society. With this long-view in mind, the Montessori approach gives the perspective and the reminders that something much more powerful and meaningful is going on than just the acquisition of information or skills; an entire person is forming, with all aspects of life intertwined and relatable. This all started from actively observing children and finding recognizable behaviors that revealed how children learn best. When Dr. Montessori identified what characteristics she was seeing, she aimed to find what real purpose each might have to human development. Nothing in nature is random, and so—Dr. Montessori reasoned—the phenomena of child behaviors, consistent across cultures, and referring to certain stages of life, must have value. The educational environments she designed deliberately employ children’s most positive learning characteristics at each age. By designing the classroom environments and teaching methods in this way, Dr. Montessori freed children to reach their full potential at each stage of their development. Dr. Montessori defined four distinct stages of characteristics and needs that children have from birth to twenty-four years, which appear consistent across cultures, countries, decades, socio-economic conditions, and races. These stages appear in plateaus of similar traits, with relatively briefer periods of rapid change in between, which occur around age six, age twelve, and age eighteen. These periods of rapid change are predictable, although, of course, they vary slightly within individuals. Between these points are years of stability by comparison, like plateaus, when children seem focused on developing certain aspects of themselves. Dr. Montessori called these plateau-like stages the Four Planes of Development. Informed with this lens, Montessori educators can make decisions and create learning environments that really meet children’s characteristics and needs appropriately. 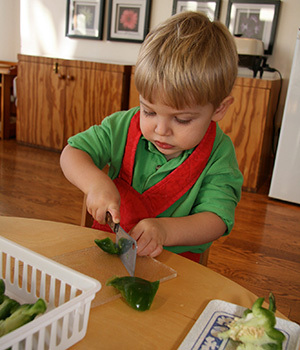 For instance, knowing that children under age six are focused on developing as individuals and need reality to form themselves, Montessori environments encourage children to concentrate on individual tasks that have real purpose—such as preparing food to eat—where they can explore real procedures and develop gross and fine motor skills. Elementary-aged children can listen to stories about how scientists believe the universe formed and dive into research explorations with their friends, drawing charts to illustrate. The Four Planes of Development give us a map to guide us as parents and educators, helping us to recognize what an individual may need and to respond to the characteristics we see. In the next article, we will look more closely at the characteristics and needs of each plane, ages birth to six, six to twelve, twelve to eighteen, and eighteen to twenty-four years of age. If you happen to drive past the school this summer, I encourage you to take a peek at the amazing prairie and everything growing there. This is our “land laboratory” for our children to explore and research in September and throughout the year, building their scientific interests and connections with the natural world. Through the immediate examples in nature, our children notice the interrelatedness of everything and learn about the laws of nature that create balance and respond to imbalances. Our prairie gives children the direct contact they need to develop a love for nature and to discover the amazing variety that the natural world presents to us. The Young Children’s Community and Primary children can observe, touch, smell, and collect specimens of all shapes and sizes to fulfill their incessant quests for knowledge. The Elementary-aged children—so full of questions and analytic ideas—can take samples, classify, and design experiments to share their results with others. Our Secondary Level students can take leadership roles by becoming stewards of this land, and go beyond our immediate resources to seek advice from experts and check the health of our prairie’s ecosystem with the larger one in our state and part of the world. 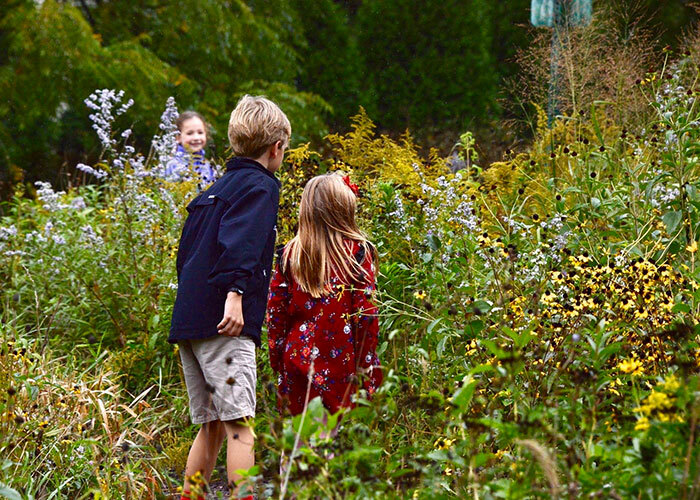 In these broad stages of investigation and care that corresponds with children’s developmental stages, the land laboratory we have on our property provides the stepping stones that ignite interest in earth’s ecosystems and real, original opportunities for children to follow their own ideas for their learning. Because children are constantly trying to adapt to their surroundings, it is imperative that we give them a sense for the whole of our surroundings, so that they may find their places in relation to not just their family, their school, or their town, but to the whole of this world that even our little patch of prairie is connected to and responds to. Our children do much of their work on the subconscious level, which makes direct contact with the natural world even more important, at each stage of their lives. Our Forest Bluff directors and our on-site naturalist, Abbey White, look forward to greeting your children in September and supporting their scientific, artistic, historic, mathematical and linguistic investigations through our living land laboratory! Summer is supposed to be fun—a relaxing time for families. But parents can also feel very stressed in the summertime. You can begin to feel like a prisoner of parenting, while children become harder and harder to please. Welcome to the summertime blues! There are two forces at work: Unrealistic expectations of ourselves and a tendency to do too much for our children. Mothers and fathers often have the expectation of themselves that they “should” make their children happy. These days, happy isn’t even enough; we think we should make them ecstatic. 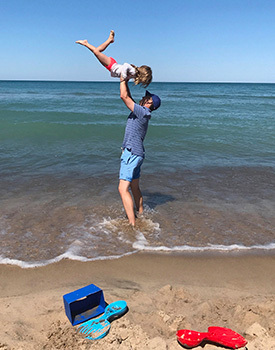 The self-imposed pressure to make one’s children rejoice in every moment of every day of their magical summer—and the guilt of not meeting such unrealistic expectations—can be overwhelming at times! And this leads to another problem: By trying to meet their every need and desire, we are stopping our children from being able to follow their natural urges to do things for themselves. Adults often think that being a “good parent” means doing more and more for children, and that that will make them happy. But when we “help” children this way, they just get more and more unhappy, frustrated, fussy, and demanding—have you noticed? Conversely, to raise a family of balanced, happy, generous children who are ready to contribute and who feel truly connected to others, is another way. When we look at the principles of the Montessori approach, we see a simple structure that guides us to give our children what they really need, and because this is based in natural development, it frees them and us, from the pressures of our current parenting culture. This overall structure has three steps: Preparing the home environment, modeling the behaviors you would like to see in your children, and allowing freedoms and choices while providing simple boundaries. Put your energy into preparing your home environment so that your children can be more independent from adults. There are always little ways to do this, in little bits each day. This will look like a “Goldilocks” environment if you have several children, and as you make adjustments to match their ever-changing levels of independence. When you travel, look for ways to prepare the environment of any restaurant, hotel room, or beach house, so your children can take care of their own needs more and depend less on you. Once you get the hang of thinking this way, you’ll be amazed at how your children’s behavior may improve! The opportunities to explore their abilities and build self-confidence and independence will feed their needs more than any lollipop bribe or screen time. Our children are driven to progress by a fierce natural force; it is our job to support that innate drive by physically setting things up for them to succeed in the environment. In a public place, we have the freedom to talk, play games that don’t loudly distract others (card games, memory games, I-spy games, etc.) and to eat or not eat the foods served. Boundaries might be: we stay seated while eating and speak politely. When children are five years old and younger, it can be helpful having a checklist of just a few family guidelines: clean up your dishes, straighten your own room, and help to make dinner twice a week, for example. But as children get older, one rule can suffice: “Take care of yourself and your own things, and be helpful when asked.” If your child’s messy room doesn’t cause problems for others, seriously think about whether that might be something you can let go of in order to prioritize other, more important things. Bring a tiny potty everywhere you go if your child is too small to climb on a toilet without your portable stepstool. Bring a child-sized cup and child-sized pitcher so your children can use these items in restaurants and vacation places. (Available online at com). If traveling, have 2 books, 2 small toys, or 2 games/card sets and drawing supplies for each child in his or her own backpack. Less is more! In my family, we used to save the undesirable toys and books we were given over the years and bring them out on the plane or in the car; these were called “travel toys” in our house. These were exciting, with all the bling, and we didn’t care if they got lost along the way. When we got home, they disappeared and re-emerged on the next trip. Put needed items within reach so your children can take care of themselves as much as possible everywhere you go. In every kitchen, prepare a low shelf or cabinet with a set of bowl, plate, cup and utensils, a sponge or rag for wiping up, and a tiny hand brush and dustpan to clean up the floor after themselves. Far from being “chores,” these activities of independence and contributing to group life become enjoyable and give children a home-away-from-home familiarity. Doing this also releases you from the constant demand to attend to the children’s needs. 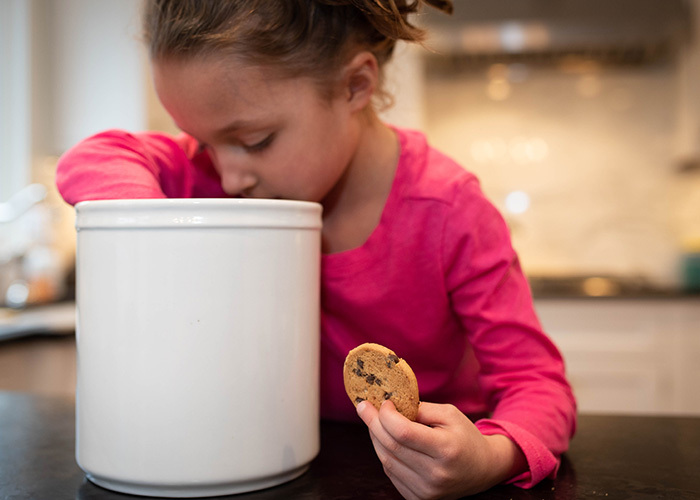 Help your children prepare a few healthy snacks in small containers or baggies on a low shelf in the refrigerator so that they can get something to eat when they are hungry, later on. If possible, make a kitchen area for the children that is safe and low to the ground. 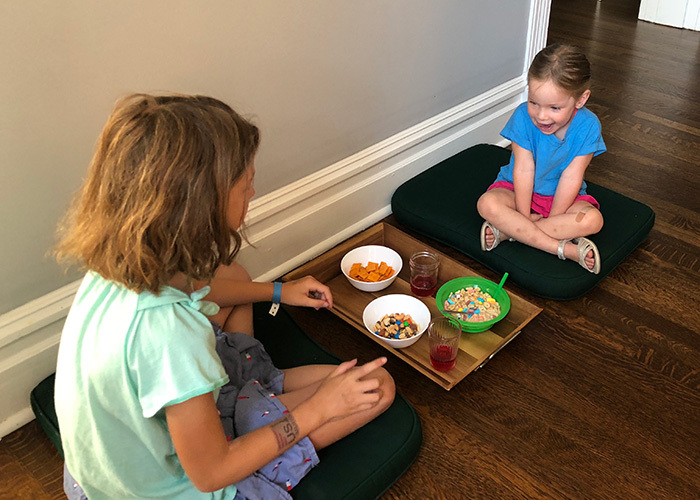 If there is no child-sized furniture, you can to do this by placing outdoor cushions on the floor as seats and a large serving tray to be their table for eating (see photo). By having a creative mindset when setting up the environment, you make tiny pockets, or moments, for yourself to read another few paragraphs in a book or relax. Just as important, you free your children to be more pleasant for other adults to be around. You ultimately prepare them to be less frustrated and more capable, cooperative, and participatory in group living. 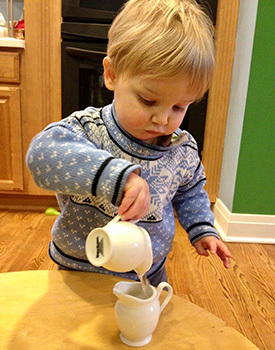 Dr. Montessori said that when we give unnecessary help, we hinder our children’s development. She wrote, “…the first task of education is to furnish an environment which will permit and aid the child to develop the functions given him by nature. This is not a question of merely pleasing the child, but of cooperation with a command of nature. Observation of the child shows that normally he has the desire to act independently; he wants to carry things, to dress and undress alone, to feed himself…In giving…independence to the child, we free a worker who is impelled to act…” (Education for a New World). Taking this in mind, prepare the environment a little bit every day, take care of yourself so you can be a living model, and watch your children blossom into the happy people you hope they’ll become. We may have made it to April, but it certainly has not yet looked or felt like spring in the Midwest. Frigid temperatures, gloomy skies, and occasional snow provide ample incentive to stay indoors with a warm cup of tea, silently begrudging the cumbersome winter coats taking up space in the closet. While I can think of nothing better than reading a good book indoors on days like these, the naturalist in me is immediately reminded of why April is one of the best months of the year for revitalizing our connection with nature. Bloodroot. Named for the red-orange sap that oozes from the plant’s stems and leaves when cut. Starting now and continuing into May, Lake County is host to two groups of unique, yet very temporary, wild visitors. The arrival of 1) spring ephemeral wildflowers and 2) migrating songbirds is truly a wonder to behold. Any day now, small wildflowers will begin carpeting the forest floor, and high above them, vibrantly-colored migrant birds, here from Mexico and South America, will dart amongst the tree branches as they continue on their journey north. All at once, an incredible diversity of wildlife and color springs into our neighborhood woodlands (pun intended!). Much to my dismay, these wild visitors disappear almost as quickly as they arrive, within a few weeks. However, as with any nature activity, all you need is nice weather and the desire to go for a walk. So dust off those binoculars, grab your children, and head to the woods before the wildflowers and migrating birds are gone! Walking into a forest, our natural inclination is to look eye level and above at the trees towering over us. However, in the same way that Maria Montessori championed the child’s development as a holistic endeavor (intellectually, emotionally, socially), we miss a large portion of the picture if we ignore the forest floor. Dutchman’s Breeches. Flowers resemble upside down pantaloons. Amid the decaying leaf litter found there, highly specialized, fast-growing plants—collectively called spring ephemerals—make a grand entrance. In the brief window of time between the final snowmelt and before the trees produce a full canopy of leaves, ephemeral wildflowers take advantage of the sunlight hitting the forest floor. Seasoned opportunists, these wildflowers race to complete their entire life cycle before the tree leaves completely shade them out at the end of May. 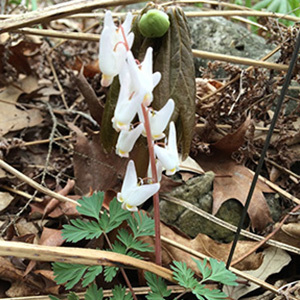 Two of my favorite spring ephemerals are Bloodroot and Dutchman’s Breeches (pictured), both of which have unusual characteristics. Standing only 6 inches tall, these two plants bloom for a grand total of two weeks! 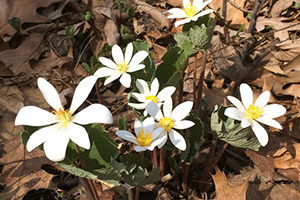 If timed correctly in mid-to-late April, a walk through the forest will reward you and your children with a beautiful display of white flowers from these plants—a welcome contrast to the brown forest floor and a bold declaration of the start of spring. 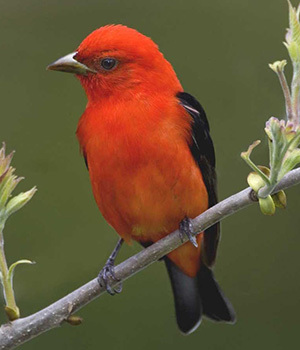 Scarlet Tanager. Photo courtesy of the National Audubon Society. In a similarly rapid fashion, millions of birds travel north from Mexico and South America, through the United States, and on to Canada each year. For most areas of the United States, including Lake County, these migrants are only passing through for a few short weeks in April and May. Hundreds of neotropical songbirds, in particular, provide a magnificent display of reds, oranges, yellows, and blues. How many can you and your children spot?! The transcontinental voyages made by these birds each year are excellent examples of the interconnectedness of living organisms on Earth, a principal tenet of Montessori’s Cosmic Education. Sharing this knowledge and experience with your child would further reiterate the importance of a global perspective and encourage appreciation for a larger community of humans, plants, and animals. 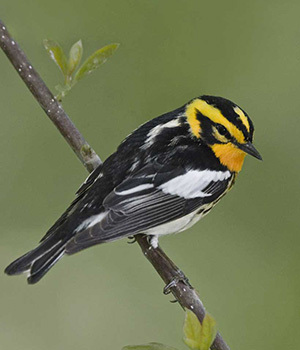 Blackburnian Warbler. Photo courtesy of the National Audubon Society. ebird.org is a great resource for gathering information about which birds have been spotted in Lake County. Not only can you see posted observations by other birdwatchers to target your exploration of this area, but you can also create your own free account and keep track of the birds you and your children have seen. Scientists often use data from eBird to track long term trends in bird migrations. Data collected by the general public, also known as citizen science, is of great value to the field of ecology. The climate in Lake County is very similar to that of Wisconsin, which is why I would recommend The Wildflowers of Wisconsin and the Great Lakes Region field guide for identifying plants in this area. The guide is small enough to carry with you on a walk, with useful information and helpful pictures. Earth Day is right around the corner! Be sure to visit the Chicago Botanic Garden’s “Unearth” Science Fair on April 21 and 22 to celebrate! There will be lots of fun activities for kids and as an added bonus, McDonald Woods has a beautiful display of spring ephemeral plants. Lake Forest Open Lands is also hosting a volunteer work day on Sunday, April 22 from 1-3 p.m. at Mellody Farm Nature Preserve for Earth Day. 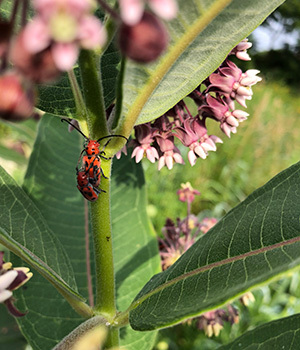 Participants can expect various hands-on restoration activities, such as pesky buckthorn removal, as well as nature hikes and a tree planting discussion. Montrose Beach in Chicago is an international bird hotspot and one of the best places to go to see a diversity of birds throughout the year. Migrating birds tend to travel along Lake Michigan and the trees/shrubs right off the water provide them with insects, berries, and shelter! If you are in the market for binoculars, there are several quality brands for any budget and for any experience level (including kids!). An important consideration is the magnification. For the recreational birder, I would recommend a magnification of 8x32. My personal binoculars are 8x32, and they are perfect for my birding passion! 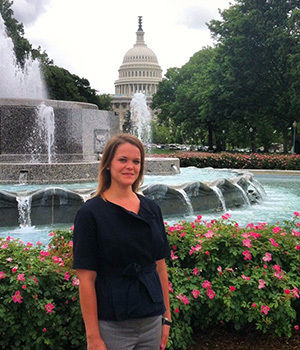 Abbey White is a visiting naturalist at Forest Bluff School. 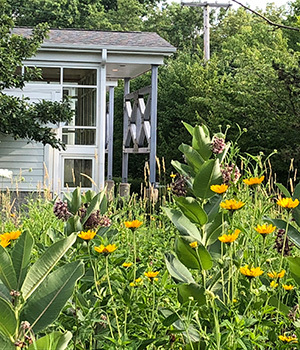 With a master’s degree in Plant Biology and Conservation from Northwestern University, Abbey is providing our school community with information on starting gardens, fostering our prairie, and more about the natural world around us this spring. Stealing and lying are two deviations from healthy behavior. They are perfectly normal things for children to do, especially as they explore the range of societal behaviors during their elementary years*; expect that all children will spend some time experimenting with each. When they are testing out what will happen, most find out and logically stop doing it. But when a child develops a pattern of stealing or lying, what then? From a Montessori perspective, repeated stealing and lying are not “normal” behaviors for a child reaching their full potential of character. It’s like testing out something but getting stuck in the “repeat” mode and not being able to snap out of it. Everyone has a conscience, so if the conscience isn’t overriding the temporary benefits from the stealing (Those cookies tasted great!) or lying (I got what I wanted again! ), then you need to step in to help. Dr. Montessori suggested that when the environment supports children’s human tendencies such as those towards work, order, exploration, communication, and manipulation (i.e., touching and movement) and frees up their inner energy for their self-formation, they will “normalize” themselves over time. This means that they become increasingly calm, focused, productive, happy, compassionate, organized, and all other positive qualities. In essence, they will reach their full potential—as unique as each one is—which is their “normalized” self. We see this happen with the children in our Montessori classrooms with their age-appropriate activities in school, and at home with similar satisfying opportunities. To create an environment that encourages this natural maturing process, we must offer useful activities that help children refocus on positive behaviors. Sometimes, we must remove distractions and temptations for a time. Socially, a child may be feeling uneasy or nervous and may get caught up in social drama, to then find themselves drawn to cause some trouble for others with stealing or lying. Whatever the reason a child chooses this anti-social behavior, they need assistance from the adults and other children to refocus their attention and energies on positive actions. If a child is stealing, tell them you need their help, and give them a positive role or job. Employ them in remedying the situation in a non-accusatory manner, perhaps by suggesting they organize the items in question. Point out to them afterwards how their actions helped the group/family or led to a chain of positive events. If a child is lying, and you are sure, gently call them on it (“Actually, that isn’t true”) and immediately point to what they can do that’s positive (“Your brother had his trucks in this basket, and we need to get them back in there. Could you help me look for them? Let’s start in the kitchen…”). The proposed activity might be a project, a piece of work, or something that interests your child. If you’re not sure whether they are lying or not, no matter; if you sense that it’s a lie, say, “Hmm, it just feels unsettling to me,” and progress with a project, an interest, or some positive action that your child can partake in. In both these examples, there is little point in punishing, humiliating, reprimanding, or arguing. By the time they’ve reached age five, children already know much of this material, and it becomes a game for them to master. If you are now seeing an emerging pattern of stealing or lying, you’re best off abandoning any initial urges to punish, threaten, or bribe. At this point, your child knows that they shouldn’t lie, they know it upsets you or others, and they are having a hard time not doing it anyway. Rubbing it in probably won’t lead to the solution. In the above suggestions, we are going straight to the solution, with no dilly-dallying on the crime. In other words, you are showing the child the path to rebalancing themselves. When we are balanced and feel good, secure, and content, we tend not to steal, cheat, or lie. Human beings have inner urges to do the right things, to be their best selves, to be “pro-social.” Dr. Montessori’s approach employs these instincts and steers us to use this positive psychology in our teaching methods and in our parenting. As such a conversation progresses, you get down to making an agreement for next time, or sharing your feelings about stealing and lying, and along the way, you are having a heart-to-heart without blaming or shaming. You are helping your child—in an emotionally neutral tone—to face their behavior and make a decision to try to do something differently the next time. The goal is simply to open the dialogue, to get them thinking, to help them develop their own conscience, rather than to assert yourself as the “Ruler” who directs their behavior. Our job as parents is to support the development of our child’s own conscience, which is a gradual process. As I was recently so painfully reminded by a psychologist, “Parents cannot follow their teenagers into every dark alley. The only one that goes in there with them is their conscience. 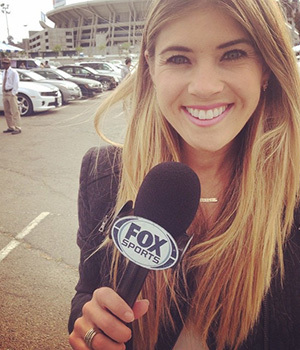 You’d better get used to it.” (Ouch!) So, helping our children build a strong conscience is the goal. And to keep our focus there, we need to point to positive behaviors, not spiral downward into punishments, threats, warnings, and diatribes about how their behavior made us feel. This doesn’t mean we can’t be honest about feeling mad, sad, or disappointed—but our feelings cannot serve as a driving force to change children’s behaviors because when they reach adolescence, that dynamic of trying to control another’s behaviors turns to turbo mode. That is a game where every player is a loser, and the stakes are much higher! The more your elementary-aged child tries to deny, point fingers, or insist, the stronger their fear and anxiety about right and wrong, and about your reaction. The only way through this forest and out the other side is to diffuse this intensity. As parents, we have got to be less emotional, less forceful, less righteous, less disapproving—a very hard feat for most of us. We feel so responsible for our children’s behaviors; we take it so personally! But when we can get ourselves out of their way, the more direct the child’s relationship to their conscience will be, and the swifter their recovery to normal, healthy behavior. To "normalize" the environment means to put our attentions on supplying some interesting choices of activity which have real purpose and connection to the home, family, or natural surroundings. Montessori wrote, “What advice can we give to mothers? Their children need to work at an interesting occupation; they should not be helped unnecessarily, nor interrupted, once they have begun to do something intelligent.” In this way, we include our children in the purposeful work of the home and family, and we support them to concentrate and engage in this work. Montessori emphasized, “The essential thing is for the task to arouse such an interest that it engages the child’s whole personality.” This point is critical: In order for an activity to really engage a child’s whole personality, it must meet the match of challenge for them. It cannot be too hard, but it must be challenging enough to demand the child’s attention. Most of the things you need to do around the house, on a child’s level of difficulty, are good choices for such activity. Many psychologists recommend a non-emotional response that focuses on “How can we fix this now?” for lying and stealing. Most recommend helping your child to clean up the issue they created. The less pointing, shaming and blaming, the easier it goes. If your child refuses to join you in cleaning something up, returning it, or clearing up a breach of trust, model doing it yourself, and then try to involve your child in some balancing, engaging activity (which is also a great way to head things off at the pass) that absorbs them and gives them a constructive home life environment. I love Dr. Montessori’s wisdom in pointing us towards meaningful activity as the answer. It resonates with the work of Csikzentmahalyi, who coined the term “flow” for that happiest, most satisfying state. Including your children in purposeful activities is a remedy for many situations, no matter their age—even with adolescents. When our sixteen-year-old gets ornery, wants to argue, or pushes the boundaries, my husband and I find that asking him to cut the tree lights off the outdoor tree, fix a cabinet, solve a problem for us, or make a meal always helps him return to his better self. It seems to bring a person of any age back into the fold, centers them to find their purpose and worth, and places them in society as a good citizen once more. * Very young children under age five may not even know or understand what they are doing when we accuse them of "stealing" or “lying.” They just know they took something they wanted or tried to make something believable to others by saying it. With very young children, a simple response without too much talking is advised. Let them see you remedy the situation, and they will absorb the rights and wrongs of behavior by observing. The elementary years are really the time when morality becomes a conscious quest, and this is what this article is referring to. For a better understanding of moral development within a Montessori framework, see our blog post How our Children Develop Moral Values. 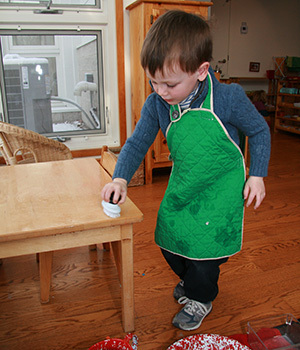 Dr. Montessori observed that children are intrinsically inspired to exert great effort when their work is purposeful. Through close observation of a child in action in a Primary classroom, we can see how Montessori fosters perseverance. 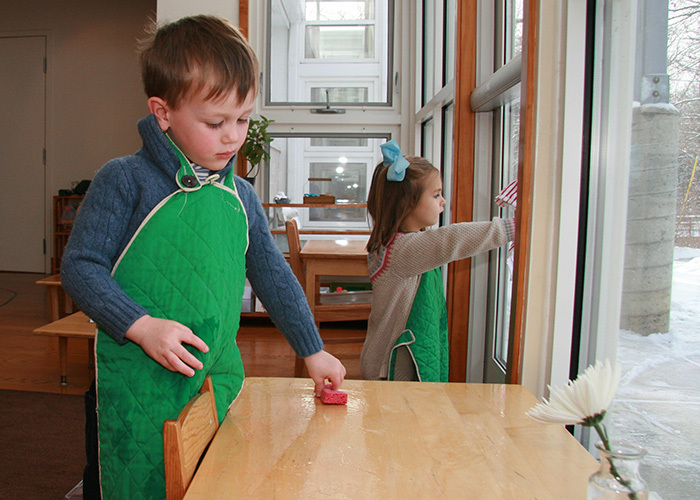 In the Montessori approach, “work” is not a dirty word; it’s a glorious word. For the child’s real “work” is to form their own, unique human being in the world, through everything that they do and everything that they engage in. Think of how you feel when you are fully immersed in something you love to do. It could be polishing your antique car, fly fishing, writing a poem, a speech, solving a math equation, or helping a client. If you have work that absorbs you in such moments, then you understand that inspiring work feels good to children, too. Of course, children do not think of their actions as work, but Montessori proposed that what children do should be respected as their work. The infant’s task is to build a person, so she is fully engaged in kicking her legs and making sounds, delighting in it, concentrating on it, going on with it even when it takes effort. And here is a main reason that Montessori is so timely for today’s youth: when we have found some piece of work that engages us fully, effort is a friend that helps us persevere. With the Montessori approach, children develop an attitude that effort is a friendly, natural part of any learning process. This is because effort is built in to every activity they engage in at school that leads them into flow. In a Primary Classroom, I watched a four-year-old boy wash a table with such gusto and flourish that he seemed completely unaware of the other children walking past him and talking. He did not seem to hear the bells a child was playing on the far side of the room, the water splashing in the sink as another child filled and refilled his bucket just five feet away, the classroom door opening, a child entering, the door closing again, or a girl tap-tap-tapping her feet while she was counting out loud at a table three feet to his left, adding four digits numbers with a bead frame. All this and more was swirling around him, and he was bent over his work, apron hanging down and wet with water, making big, round motions with his arm as he scrubbed the surface of the wooden table. His long curly bangs were swinging over his brow, the shoelaces of one shoe untied and lying on the floor while he rocked forward and up on the balls of his feet to reach the far side of the table, one hand flat on the table to support his weight. The boy paused when he had made the soapsuds cover every part of the table surface. He stood upright, took a step back, brushed his dark curls from his face with a wet forearm holding the child-sized scrub brush, glanced up at the child sitting near him, and just as quickly bent over his floor mat to his right with all the table washing materials laid out on it: sponge, soap dish with soap bar in it, a wash-cloth for drying, a tiny bucket half filled with water. He rubbed the scrub brush on the soap bar, stopped and looked at the bristles, re-wetted them in the bucket, and rubbed them on the soap again (quite firmly). When he noticed suds building, he paused again, glanced at the underside of the brush, and went back at it with the table surface. He scrubbed and scrubbed, moving his circular motions around to cover the entire surface again. This repeated and went on for a good 15 minutes. Beads of sweat formed on his forehead and his hair started to stick. He seemed unaware and unfazed, completely absorbed in his whole body movement. Then he put the brush on the floor mat, squatted down and took the sponge, and started wiping the table in smooth, long swipes from one side to the other, eventually removing most of the suds. He bent over and plunged the sponge into the water bucket, and at that moment another boy came over and said something to him. He smiled up at him, then looked back down and squeezed the sponge out with both hands, and the other boy walked away. He stood straight up, looked after the other boy for a moment, then watched the water dripping into the bucket from his sponge, long, slow drips. He looked pensive, watching…then squeezed the sponge out with more force, watched, then started wiping the table again. He stopped after a while and sighed, stood up and noticed a girl walking by with a tray of flowers. He then dried his table with the dry wash cloth and quickly cleaned up the things on his mat, returning the water from the bucket into the child-level sink and taking the scrub brush over to the sink and rinsing it with a gushing stream of water (it dripped from his hand the whole way back to his mat but he did not notice this). He squatted down to his mat and put the sponge, dish with soap, and scrub brush back into the little bucket. He then paused and pulled them all out again. He wiped the bottom of the bucket with the towel, walked across the room to drop it into the hamper, and retrieved a fresh towel from the shelf. He then walked back to the mat and again put each item into the bucket, with the folded towel on top. He carried the bucket by the handle—swinging it slightly as he walked—and placed it back on the shelf. He returned and rolled up the mat, stood, and then suddenly slowed down, straightened himself upright, and carried the mat ceremoniously towards the shelf with a tall posture, holding the rolled mat like one might a flagpole in a parade. He concentrated on his steps as he walked very slowly with dignity back to the shelf, returning the mat to its designated place and walking away with a relaxed and refreshed expression on his face. Such episodes repeat throughout the day in a Montessori Primary classroom. This is a prime example of how a child organizes his thoughts and motions with a sequence of actions, integrating his will, decision-making, and body movements—both gross motor and the small motor of his fingers—and exercising care for materials and the environment. The child uses such exercises to satisfy his craving for purposeful work: not of the work of washing a table per se, but the deeper work of building all the cognitive and physical aspects of his personality. 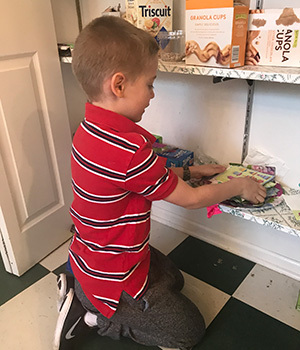 Dr. Montessori pointed out that young children need these organizing activities that have real purpose and connection to community life to build themselves through. The effort and focus that rose out of this determined activity was his alone; a child can measure and respond to the level of effort he or she feels rising in them during the activity and adjust and work with that sensation of effort. It is completely unadulterated and not manipulated or created by an outside force, but comes from within that individual child. So, effort is a different experience than the one we deliver to children when we give them an assignment. Accomplishing specific tasks later when asked to is something our Montessori children can willingly do with confidence because of such numerous experiences they have had of flowing with effort by their own accord. These simple practical life activities, such as washing, cleaning, and arranging, lay the foundation not only for effort but for the organizing of thoughts as a child experiences sequences of actions and their outcomes in all their stages and orders. 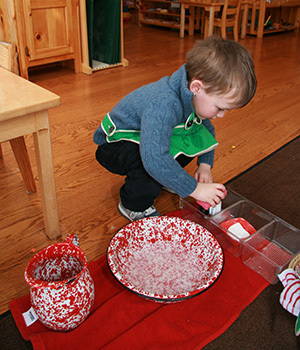 Montessori uniquely employs such activities as the building blocks for thinking and doing. They deliberately and precisely set the stage for mathematics, language arts, and all the child’s intellectual and physical work to come. Simultaneously, our children’s healthy approach to effort translates into resilience and perseverance that will distinguish them in their later years.